The Queen Triggerfish will always be one of my favorite fish because it was the subject of the very first ReefNews photograph that was any good at all. At the time, we thought that picture was really good. But our skills have improved and we now have better cameras, so we can take great pictures like this one. 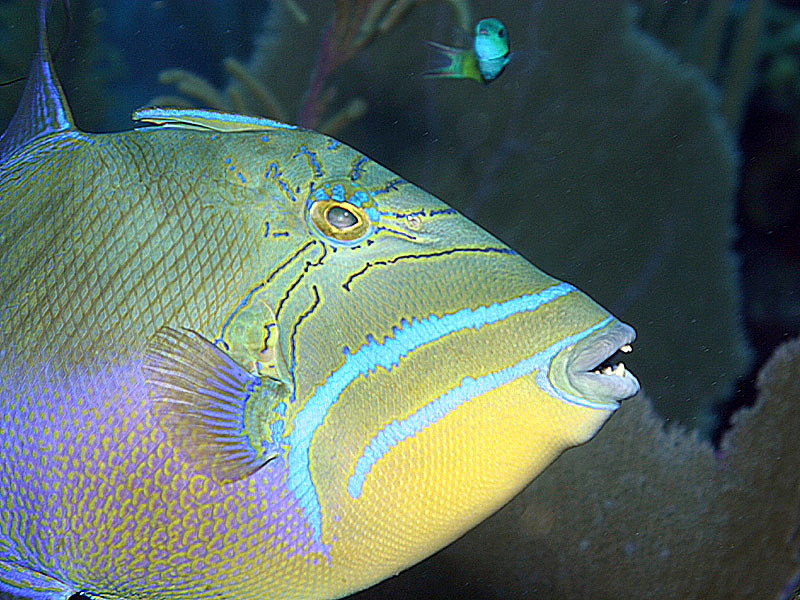 This picture shows a closeup of the face of an adult Queen Triggerfish. You can see its bright colors, incredible markings, translucent pectoral fins, and the spine at the top of its head that gives the Triggerfishes their names. Notice this fish's big lips, and the sharp teeth that allow Queen Triggerfish to crunch the shells of urchins and snails. Click here to compare this fish to another Queen Triggerfish photographed last year in The Bahamas. The little fish swimming just above the Queen Triggerfish is a Blueheaded Wrasse, identified in this picture only by the markings on its tail. ReefNews President Jonathan Dowell took this picture using a Canon 10D digital camera with a Canon 28-105 mm zoom lens in an Ikelite housing with an Ikelite strobe. Camera settings were f/8 at 1/125 and 105mm zoom. This picture was taken in the morning, at 10:40am Cayman-Islands local time.